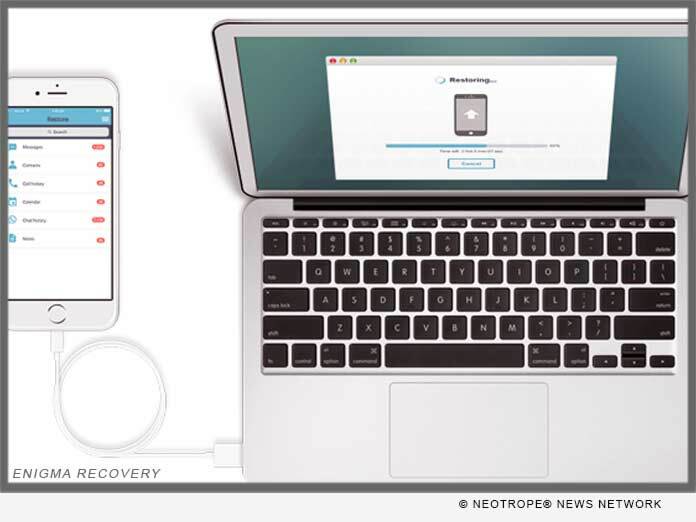 One of the leading global data recovery brands specializing in iOS data recovery today announced the new software update that has tripled recovery speeds. Enigma Recovery from ENIGMA DIGITAL continues to push the boundaries of iOS data recovery, through innovative new algorithms and vast improvements to user interaction. The software that has now enabled a 3 times faster iPhone recovery speed, expertly refining the experience for customers worldwide. (BIRMINGHAM, U.K.) — NEWS: One of the leading global data recovery brands specializing in iOS data recovery today announced the new software update that has tripled recovery speeds. Enigma Recovery continues to push the boundaries of iOS data recovery, through innovative new algorithms and vast improvements to user interaction. The software that has now enabled a 3 times faster iPhone recovery speed, expertly refining the experience for customers worldwide. Enigma Recovery can recover deleted messages, contacts, calls, notes and calendar items from iPhone, iPad and iPod Touch devices. First released in January 2013, the recovery algorithms have gone from strength to strength allowing data recovery, data transfer and data backup functions. The recovery tool has the ability to extract data dating years back, from the internal database of any iOS device. A team of highly advanced software developers sit at the helm of the software’s improvement journey with each release. The new Enigma Recovery release has reached remarkable speeds and will be available to download from the main website from today. “The team spent a good amount of time optimising the performance. We were able to come up with a number of implementations that have completely transformed the data scan speeds. The outcome is better than we had hoped for, greatly enhancing the user experience like never before,” said Brice Grenard, Senior Software developer, Enigma. With online acknowledgements and recommendations from Macworld, Tech Advisor, Cult of Mac and CNET, Enigma Recovery is fast becoming the user’s first choice for expert iPhone data recovery. The software is also the first of its kind offering two-factor iCloud recovery authentication, providing the safest third-party iCloud data download available. Enigma Recovery is an iPhone Data Recovery tool that allows users to recover deleted data from iPhones, iPads, iPod Touch devices, iTunes backup files and iCloud backup files. It is the only UK smartphone data recovery solution offering users a free trial download, with preview options. Upon purchase users go on to view all data found and restore previously deleted items back to their device through the free Enigma Restore app. With Enigma Recovery, users can recover deleted messages, contacts, notes, calendar events and calls. Learn more: https://www.enigma-recovery.com/ios/iphone/sms-text-messages/. More about iPhone Data Recovery: https://www.enigma-recovery.com/ios/iphone/. More about Enigma Recovery: https://www.enigma-recovery.com/.